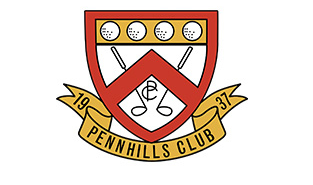 Founded in December 1937, the Pennhills Club is nestled in the forested mountains of McKean County. Designed and constructed during the 1920s by famed amateur golfer, golf writer, and course architect Walter Travis, this historic golf course features lush greenery and gorgeous backdrops of the nearby hillsides from each hole. At just over 6,400 yards with a par at 70, this 18-hole championship golf course offers a challenging and delightful experience for all who visit. The brick and slate Tudor-style clubhouse was designed by American architect Clifford C. Wendehack, who designed the clubhouse at the elite Winged Foot Golf Club in Mamaroneck, New York, and planned out Pennhills’ brick and slate Tudor-manor style clubhouse in a similar style. The club has had the pleasure of hosting notable golfers such as Bob Eastman, Marty Fleckman, Gibby Gilbert, Rocky Thompson, J.C. Goosie, Sam Snead, and Gene Sarazan. Even MLB Hall of Famer Joe DiMaggio visited the club for the 1980 Zippo Open.